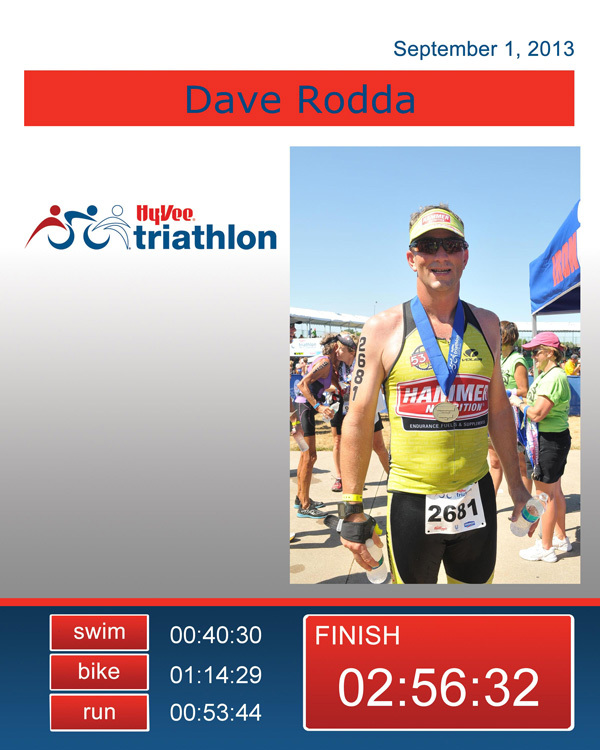 Hy-Vee Triathlon 2013 Race report: Today I did my First 5150 Olympic distance triathlon. 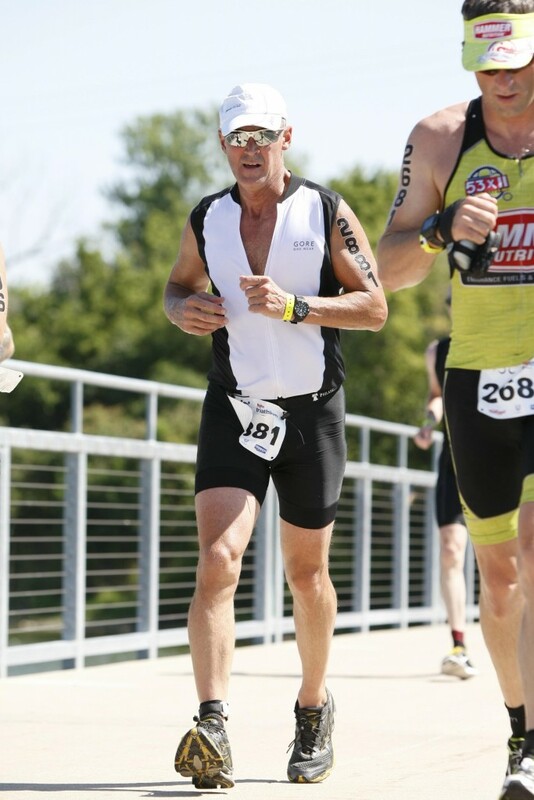 It consisted of a 1500 meter swim, a 40K bike and a 10k run. The race was held at Grays Lake in Des Moines, Iowa. Pre-Race Report: The race was delayed 45 minutes due to a thunderstorm that came through at 4am. The water temp was 86.5 degrees so the race was not wetsuit legal. I felt good about the race and was confident heading into transition to setup my gear. I met up with some of my morning swim group and a couple other Zoom athletes in transition and walked together to the beach to the swim start. My wave was third from last so I had over 1.5 hours to warm up in the lake. I actually warmed up three different times to try and stay loose. Swim Report: The swim start was a time trial start. We lined up with three others in our age group and were sent running into the water to start our race. I lined up with two people I knew were faster than myself so that I could swim behind them and have some room at the start to get into my rhythm and get comfortable. The swim went great except for one minor problem. My goggles were fogged up so bad I could barely see the turn buoys. The Turn buoys were bright green and the line buoys were orange. After I turned at the first turn buoy I sighted something green off in the distance and started swimming towards it. The waves were hitting me in the face when I looked forward to sight as we were swimming into the wind. After what seemed like way too long I noticed I was swimming all alone so I stopped and took off my goggles and looked around. I was way off course and what I thought was a turn buoy was actually a volunteer in a green t-shirt the exact same color as the turn buoys riding a jet-ski. I had to swim back onto the course and head to the actual turn buoy which added some time to my swim. When I got around and was almost at the finish line I hit ground with my hand and stood up and ran a short distance before going back to swimming. All in all it was a great swim for me as I was totally comfortable and kept a slower pace so I would be fresher for the bike. I finished the 1500 meter swim in 40 minutes and 30 seconds. I had done my first swim without any panic and it felt great to get over that brick wall. 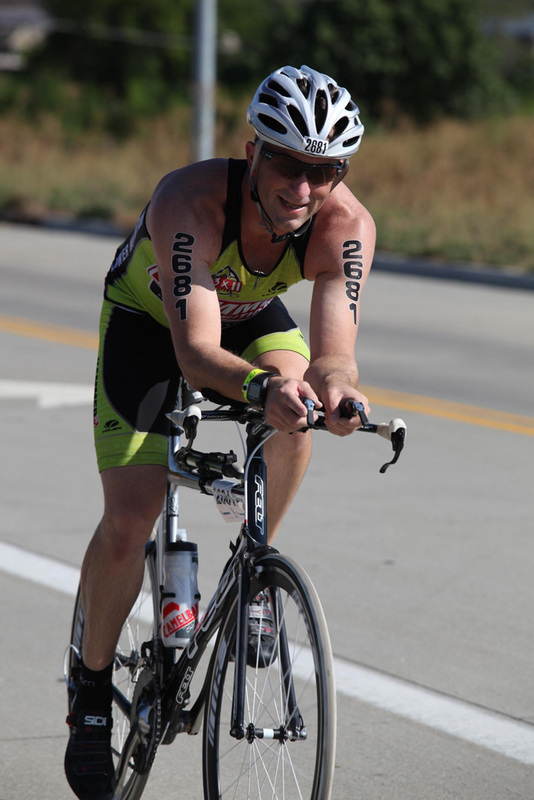 Transition 1 Report: When I got out of the water I sprinted up the hill to get into transition. This short sprint left me gasping for air a bit more than I wanted. When I arrived at my bike I sat down and drank a bottle of my energy drink and changed into my biking gear and grabbed my bike and headed out to Bike out. Putting socks on wet feet is a time consuming thing. I will correct this next year so I don’t have to have socks during my races. The time it took for me to catch my breath and get out of transition was way too slow at 4 minutes and 47 seconds. I really need to work on this part of my race as I am giving free time to the others by taking so long. I tend to forget this is a race and I talk to others around me far too much. Bike Report: The bike portion of the race was very windy. While waiting for the swim start we could see the pro cyclists coming in and many of them had bloody legs from falling. So I told myself to take it very safe and not push the turns too hard. I started out passing people from the start and only got passed by two people on the bike. The wind really cut down on the time but I was very happy with my pace of 20 MPH and finished the bike portion in 1 hour 14 minutes and 29 seconds. During the bike ride my left leg started cramping and it was a concern for the run so I took the last mile really easy and really spun my legs to try and wake up my left leg. When I got off the bike my left leg was almost totally numb. Transition 2 Report: I ran my bike from the bike dismount area into the transition area and placed it on the rack. I removed my bike shoes and put on my running shoes. I put on my visor and grabbed my handheld water bottle and put on my number belt. I finished another bottle of my energy drink and headed to the run out. I am not sure where I lost so much time in T2 but my time was far slower than I had hoped. This was by far the largest and busiest transition of any race I had done so far. My time was 3 minutes and 3 seconds. Run Report: We ran along the trail that went downtown and then looped back. 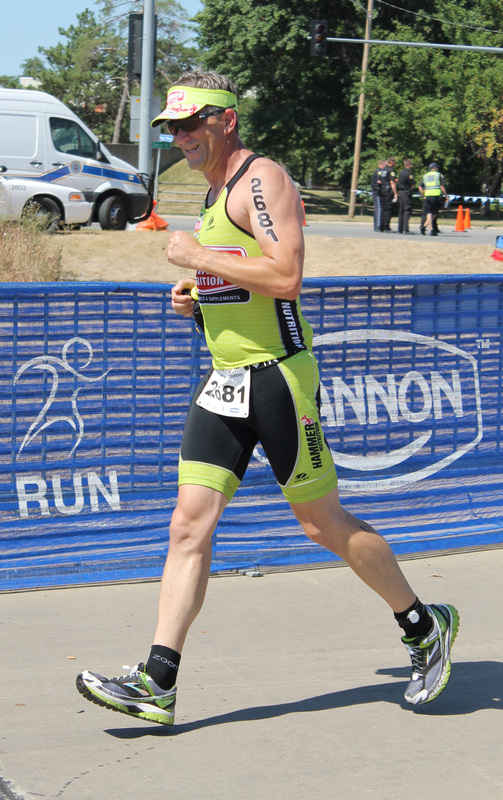 I started out conservatively as I wanted to make sure my left leg was able to get me to the finish line. I overcompensated with my right leg and this caused my right leg to start cramping also. Once this happened I was in survival mode on my run rather than racing. I just wanted to finish now so I stayed at a slow but comfortable pace and just kept going. As I came over the bridge that took us close to the finish line the crowds were amazing. I started running faster and could see the finish line. As I got onto the finishing carpet about 200 meters from the finish line another runner flew past me and next thing I knew I was in a dead sprint trying to beat him to the finish line. I had planned on running slowly across the finish line so that I could get a good finishing picture. My sister was there waiting on me to get my picture. That plan went out the window when the competitor in me took over. We sprinted past at least 20 other runners and I passed him just before the line. We ran so fast that my sister did not even see me cross until the announcer said my name. I finished the run part in 53 minutes and 44 seconds. 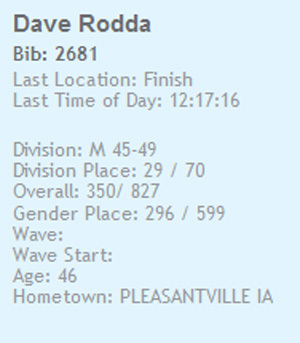 I finished 350 out of 827 and 29 of 70 in my age group. Summary of the day: Now that I am swimming more comfortable in the race I need to really work on getting some speed into my swim. That will take lots of time in the pool this winter but I am confident I can get my swim time down by about 10 minutes which will make a big difference in my finish time. The swim is the first thing you do and it sets the stage for the rest of your day. I am determined to become a swimmer not a triathlete that survives the swim. I still need to get some speed in my bike however I am really happy with my progress so far. I maintained the same MPH average in this race as I had done in the shorter sprint races. I have to keep telling myself that 5 months ago I did not even own a racing bike. I am still at the beginning of this journey and I have so much more I want to do. I need to work on my running a bit in the race. My focus this race was the swim and my run showed it. I need to keep pushing instead of running with the pace of those around me. Getting out of the water with a slow time and starting in the rear of the swim puts me on the run with many good swimmers that run slower. So I don’t really have a rabbit to pace me or to try to catch. I find myself running with the others in the race and let my pace slow when I do. This is something I will work on for the next race. Final note: Even with the issues and things I need to work on I finished the day with a great sense of accomplishment. I completed my first Olympic distance triathlon in under 3 hours and I did it with a smile on my face from the time I went into the water till the time I crossed the finish line. This race was so much fun and getting to join my swim group at the finish line for the awards ceremony was really cool. Many in our group got medals for finishing in the top three of their age groups. It was really great to see all the success our group had. My swim coach Scott Avitt and myself as I finally caught him in the race of all places on top of that bridge we had done laps under swimming from the beach to the bridge so many mornings at 5am in the dark. The things he taught me while treading water under that very bridge helped me to get past my swim panic issues. I would have never made it to that bridge during the race without his encouragement. It was so fitting to see him on the bridge and to find a picture of that moment was priceless. He has become more than a coach and I am proud to call him a friend! Side Note: If you read my last race report from Bluff Creek Triathlon you read about a young lady I stopped to help on the run. 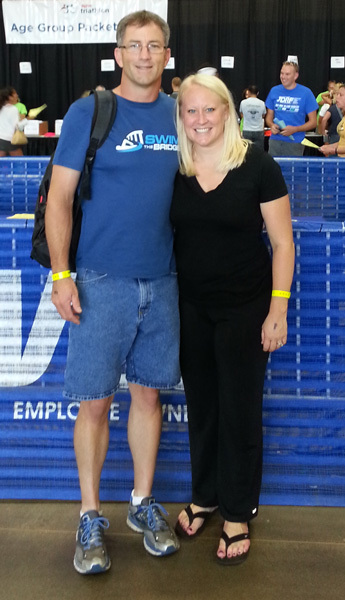 Since that race we have trained together and she is part of my swim group also. It was incredible to see how far she has come in just three weeks from that race. She had a big smile on her face as she sprinted across that finish line and she looked very happy as she stood on the podium at this her first Olympic Distance race with a second place silver medal around her neck for her division. Tiffany is going to do some remarkable thing in her life. Her drive, determination, and willingness to put in the work to get to where she wants to be motivates me to push myself harder every day. Tiffany and me at packet pickup before the race.